GET THE TWIST KIT TODAY! The Best Premium E-Juice Flavors! No Tar, No Ash, No Smoke, No Carcinogens. People love Vapor-Blends vaporizers. Vapor will not make your clothing or your home smell like traditional cigarettes. Instead of throwing away money on traditional cigarettes that can cost upwards of $10 per pack in some states, invest in a superior product. 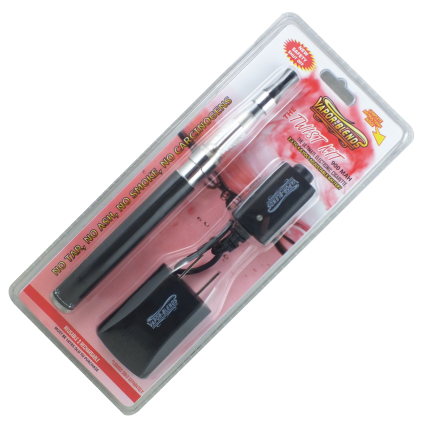 Try vaporized e-juice blends and vaporizer kits from Vapor Blends. Vaporizers are almost nothing like they were few years ago. Today, vaporizers and blends are easier to use and better than ever before. In addition, vaporized blends do not limit vaporizer cigarette smokers to a simple tobacco flavor. Experience a superior smoking experience with different vaporized premium e-juice blends, from Banana to Wicked Whiskey. At Vapor-Blends, we hold all of our products to the highest standards. We have a master chemist to develop all juice flavors and nicotine levels. We also have QC and QA personnel who supervise the production process at all times. Our quality control and testing lab is not only unique to the industry; it allows us to guarantee that you will purchase a superior and safe blend every time. We are a family business, and our friendly staff is available to help with whatever questions you have about our vaporizers and blends. Instead of throwing away money on a pack of cigarettes at the corner store, you can enjoy the following vaporized blends. We offer over 50 premium blends with a nicotine level of 0mg, 6mg, 8mg, 16mg, or 24mg. A few of our blends include Root Beer, Juicy Fruit, Watermelon, Coffee, Piña Colada, and Clove flavors. Of course, we also offer a traditional Tobacco flavor. We use cutting edge chemistry and quality assurance to deliver a superior smoking experience. Our scientific approach to creating innovative vaporized blends allows us to introduce vaporizers and e-juice to customers like you. Learn why people love Vapor-Blends and our full line of products. Buy some for you or a friend today! Look no further for Vaporizers, E-Juices and Accessories. Check out our shop for what you need!